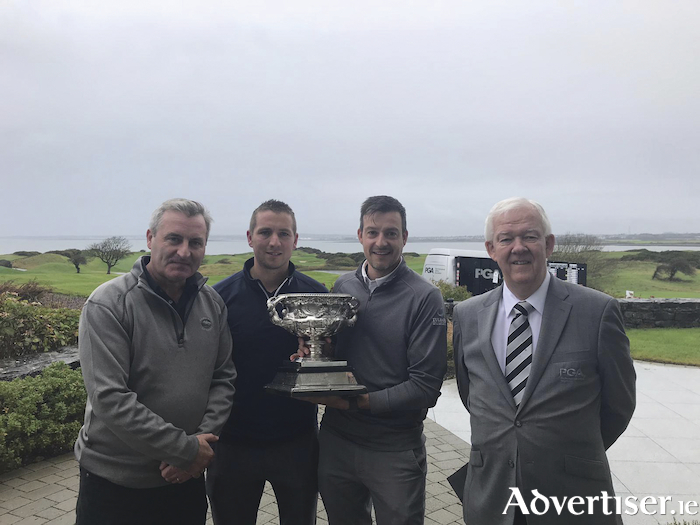 Galway Bay Golf Resort director Ronan Killeen, Damien Coleman (course superintendent GB), winner Simon Thornton, and Michael McCumiskey after the successful PGA tournament. Galway Bay is hoping to hold more major tournaments after hosting last weekend's 108th Irish PGA Championship. Simon Thornton, of Tulfarris Golf Resort, has won the tournament by one shot. The event was cut short due to weather conditions with Thornton's score of -3 enough to win, followed closely by Richard Kilpatrick -2 and David Higgins`-1. Galway Bay director Ronan Killeen said there was some superb golf on show despite the weather. The event was preceded by the Corrib Oil Galway Bay Pro Am, which was won by Brian McElhinney of North West Golf Club shooting a level par 72.